That is a very good question. I have asked about that before. Someone told me that the Freeman creature had a similar glide like movement. For the people that have claimed they have seen the creature in the flesh. Have any of them on this forum seen a similar gate if they saw the creature walk ? I think her means of locomotion is simply evidence of the evolution of bipedalism. Her elevated leg may not be due to the length of her foot, but her bent leg gait as well. "But just like the mid tarsal break showing archaic feet when compared to a human arch? " It's interestin' this archaic characteristic is still found in our own feet. What has always fascinated me to no end, an everybody knows this, is this characteristic of the primate foot wasn't common knowledge in 1967, science argued against said characteristic bein' found in a bipedal primate...until only recently. We know the depth of the PGF tracks were to deep to be made by a man in a costume. Skeptics claim they were hoaxed afterwards, that means Roger an Bob not only understood primate foot anatomy decades ahead of time, they incorporated said characteristic into the filmed subject, its tracks...an then never cast an example of their masterpiece ! They cast the flattest tracks they could. I agree regardin' the compliant gait with their suggested body mass. I think their compliant gait acts as a shock absorber. The mid foot flexibility disperses the weight an forces applied to the foot to a much greater area than in our feet. As heavy as they are, they'd break their toes durin' toe off. Her compliant gait, her forward lean or hunched torso, this is her bipedal evolution. We have to remember, if our bipedalism was so efficient, why do so many of us suffer from back pain unlike our other primate kin ? I agree with MIB...the PGF shows a sasquatch. I think they call those things rabbits. You been in Dmaker's stash? Nope it’s a possum alright. Just weird to see one without a tail and that colour. It timeshares between my yard and my neighbour’s shed. Loves cat food and gardens. Do we know how much? Isnt there a picture measuring degrees? Im gonna look through my books. That's how it all starts. It won't be long before you're telling us of out of place bird-calls, and disgusting, unexplained odors. Then, discovering size 23 bare footprints. Stock up on garlic, as you'll soon be distributing it from your doorstep. The compliant gait does reduce stress on the knee joints as well, and given a creature of such substantial weight, that could well be a critical factor over the life time of such a being. True that, guyZ, it also means that the knee is closer to the ground so a higher rear leg lift as well as a higher opposite knee lift might be necessary. Agreed, 100%. 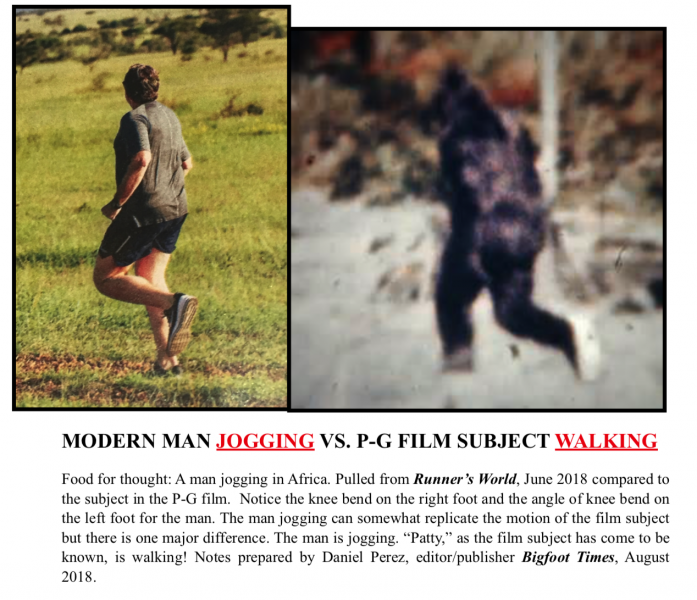 And there is a consistent, compliant gait exhibited in other footage and descriptions of Bigfoot as well. Their walking style is apparently very deliberate and powerful which makes perfect sense for their anatomy and environment, just as our walking style makes perfect sense for our anatomy and our environment. Nature has a way of working such things out to near perfection, whereas Bigfoot costumes do not. Good idea there. If the shin was very short, the lower leg would have to lift very high to allow the foot to clear the ground. This could be worked out geometrically for different proportions of thigh, calf, and foot. We could perhaps then understand why Patty had to lift her shin so high. Also, a high shin rise has been reported by others for other videos. Perhaps we now have a reason why this makes sense. It still requires some confirmation with measurement (ratios only).